Despite the rising enthusiasm toward both the group's first standalone movie and the appearance of fan-favorite Harley Quinn on the big screen, the Suicide Squad hasn't had an easy time of it over the past couple of years, certainly not enjoying the spike in popularity DC expected out of ‘em. The relative success of the animated film Batman: Assault on Arkham seemed to bode well for a live-action take on Task Force X, the government group that tosses low-ball, incarcerated villains from the DC universe into dangerous missions, so that they can shave off a few years from their sentence. After the tepid reception to David Ayer's clunky and awkwardly-toned Suicide Squad, however, interest has settled back down, leaving any future takes on the group with an uphill battle against the impressions left by that film. The chaotic and gleefully violent new entry into the DCAU, Suicide Squad: Hell to Pay, grasps both what the first animated film did right and where the live-action film faltered, relying on the wackiness of superpowers as a vehicle for suspense that swerves the squad back on the road to success. Those expecting a credible, grounded story may have come to the wrong place, though, as Hell to Pay relies on a very specific plot device to make the story work: a literal "Get Out of Hell Free" card. 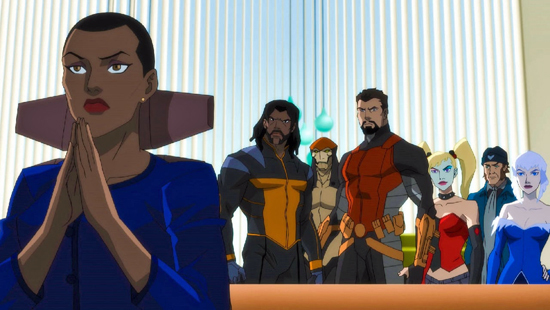 That's right, the now svelte Amanda Waller (Vanessa Williams) once again gathers together an … uh, eclectic crew of assassins, henchmen, and superpower-wielding baddies to hunt down a piece of paper that guarantees redemption in the afterlife. Predictably, the near-faultless marksman known as Deadshot (Christian Slater) takes up the mantle of leader as he oversees a group of familiar and not-so-familiar rogues on a hunt for the item; Harley Quinn (Tara Strong), Boomerang (Liam McIntyre), and Killer Frost (Kristin Bauer van Straten) return for this mission, while Bronze Tiger (Billy Brown) and Copperhead (Gideon Emery) add some new blood to the mix. Personalities and motivations clash as they discover who else is in search for the "Get Out of Hell Free" card, shifting from the current owner of the card -- a pro "dancer" named Steel Maxum -- to villains pursuing it who are both immortal and exist in alternate realities. While Assault on Arkham transpired within the brilliantly established universe of the Batman: Arkham videogames, Suicide Squad: Hell to Pay doesn't latch onto enough distinguishing traits from its precursor to make it a "sequel", though it could serve as one if you squint hard enough. Instead. Director Sam Liu and his creative team have tailored the characters and atmosphere in such a way that it exists neither within the game universe nor that of DC's live-action realm, borrowing bits-‘n-pieces from both to make it an amalgamation that can now freely coexist with the DCAU proper. That means Harley Quinn sports the blonde pigtails with pastel-colored highlights and eyeshadow instead of her more jesterly look from The Animated Series or the early-2010s Suicide Squad comics, while the entire cast gets new voice actors: Tara Strong returns to the role of Harley Quinn (whom she played in the games), while Christian Slater's distinctively raspy voice takes over for Neal McDonough as Deadshot. Hell to Pay aims for Task Force X to establish its own distinctive yet familiar presence in the DCAU, and for the most part, it hits that mark without any serious issues. They're hunting for this "Get Out of Hell Free" card, which should hammer home a few things about the intentions and tone of Hell to Pay: that the deeper mystical elements of DC's universe are brought to the surface as realistic concerns here, and that one shouldn't take the story's moving parts too seriously. Why this device has been made into a card, whether it actually functions as advertised, and why everyone seems to trust in its powers probably shouldn't be dwelled upon too much, as it's just like almost any other plot device engineered for Task Force X to fetch … not unlike in recent runs of comics. Yet, the prospect of redemption promised by the card does reinforce a thematic element in the storytelling, since all of the villains -- both the antiheroes of the Suicide Squad and the baddies hunting down the card -- have done things that they'd like to have absolved when entering the afterlife. This results in a compelling air of uncertainty surrounding the entire group's decision-making, since they're all participating in this mission in exchange for time off their sentences, tapping into philosophy of sorts. It's a little jarring to hear and get used to Christian Slater's instantly identifiable voice as Deadshot, but those watching will need to do so because, unsurprisingly, the character takes a commanding role in Hell to Pay. While he's voiced the character before, the charismatic smarminess that Slater brings to Floyd Lawton dials his attitude up a few too many notches, skewing too roguish and not polished or professional enough to befit the assassin. After a little time with him, however, this tweaked Deadshot become entertaining as he navigates the rest of this iteration of the Suicide Squad, butting heads with the insistently non-lethal and stoic Bronze Tiger and the routine brashness of Boomerang; oddly, Slater's more sarcastic performance as Deadshot cuts into his rapport with the Aussie renegade, usually the one who's rough around the edges. Beyond Deadshot, Hell to Pay spreads its attention fairly evenly this time among the rest of the Suicide Squad, even minimizing Harley Quinn's participation to mostly one-liners and actions just about anyone else could've executed. Harley's taken a backseat as a less integral character this time around … and with how much exposure she's recently received, that's perfectly fine. These exchanges between characters are critical, since the action-movie plotting executed by DC animation vet Alan Burnett (Mask of the Phantasm) relies on the standard, obligatory moving parts involved with pursuing an item that doesn't pose an immediate threat. Burnett and director Sam Liu get this, though, becoming clear in the outlandish violence and insistent dark humor splattered throughout the film, which really doesn't need much more than searching for a MacGuffin- like item to keep it all glued together. Instead, the motivations for villains of all stripes to acquire this card becomes the narrative thrust to Hell to Pay, which draws in quite a few interesting entities from many corners of the DC universe, most of which I'm going to avoid spoiling; however, it's hard not to mention how the presence of a new, zany iteration of Doctor Fate factors into the events, which works alongside Alan Burnett's amusing yet still dark and introspective scripting. The splattering of blood, violent rhetoric, and the brand's willingness to kill people off earns its R-rating through smartly orchestrated confrontations, but not offensively so and not without being tethered to reasonable interactions and reactions between villains as people. The live-action Suicide Squad movie lowered the bar for future movies about the group, so claiming that this one's better than David Ayer's stab at Task Force X isn't saying much. Thing is, Hell to Pay actually feels like one of the chaotic plots jumped off the comic-book pages, besting DC's prior live-action attempt with more organic and humorous dialogue, a willingness to go all-out with violence where necessary, and a firm grip on the antiheroes as clashing ex-villains who may not bond after all's said and done. Whether it's on the same level of Assault on Arkham is something else altogether; however, when stepping back and looking at the big picture, both end up doing about the same amount right and wrong amid the action. 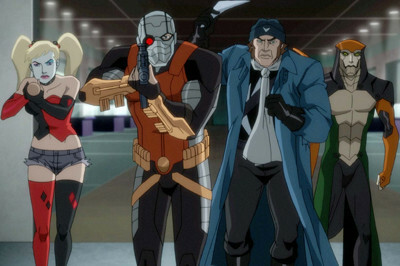 Despite not being entirely connected to this second animated film, Assault on Arkham succeeded with established world-building around Task Force X and injecting brazen humor into dark conditions. Hell to Pay doesn't abide by the same rules or engage in that caliber of world-building, but it has a bloody blast in getting the conflicted morality and camaraderie between its team members right. 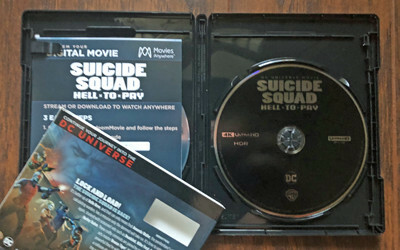 Suicide Squad: Hell to Pay zooms onto home media from WB and DC in a fairly standard 4K package here, presented in a black double-disc case holding the 4K Ultra HD disc and the standard Blu-ray as Disc Two. A semi-shiny metallic slipcover duplicates the front and back artwork, while the discs inside are either navy-topped or silver-topped with little DC-themed design elements. A Movies Anywhere Digital Copy has also been included. DC's animation department hit the ground running with a couple of stellar 4K releases of their original movies, telegraphing strong colors, sharp lines, and nimble black levels that deftly represent their intentionally dark artwork. Suicide Squad: Hell to Pay is no exception, and there's a lot of vivacity to absorb in the 1.78:1, 2160p 4K transfer. The glow of Deadshot's eye apparatus and radiating power, the coolness of Killer Frost's eye blasts and metal surfaces, and the radiating sunlight and neon shades pouring onto people's bodies produce exceptionally saturated and luminescence-aware imagery. The HDR also slips into effect here, which can be seen in the punch of heat-cut metal in the middle of the night and Frost's bright-white hair in the sunlight, amplifying those glowing elements in the artwork with exceptional strength. A few subtle color banding instances crop up, but that's likely the result of the artwork itself instead of the disc's faults. Lines are tremendously clean and bold, plentiful black levels -- especially in nightclub scenes -- are rich but not so heavy that all detail gets lost, and the movement of characters remains fluid and free of distortion throughout. Hell to Pay becomes yet another successful 4K mission from DC. As is their current modus operandi, no next-gen audio accompanies the animated feature, instead sticking with a 5.1 DTS-HD Master Audio treatment that gets the job done about as well as live-action blockbuster tracks. Projectile sonic waves (of a couple different types), blasts of ice, and, of course, gunshots encompass both the lower-end and midrange bass levels, filling the stage with pulsating bass and firm responsiveness. The extreme upper and lower elements of the track aren't entirely remarkable, though, lacking much healthy punch in bodily thuds and explosions and with some bullet shots and impacts not piercing quite as hard as one might expect out of the track. Other ricocheting gunshots, debris collisions, and hand-to-hand connections are great, though; the film's key brawl in a nightclub contains both the positives and negatives of the track. Channel responsiveness makes up for any discrepancies, though, utilizing the front and rear channels for capable surround atmosphere during the action sequences, isolating pops of firearms and shattering glass exceptionally well. Dialogue is, unsurprisingly, faultless, razor-sharp and possessing zero perceptible audibility or distortion issues. 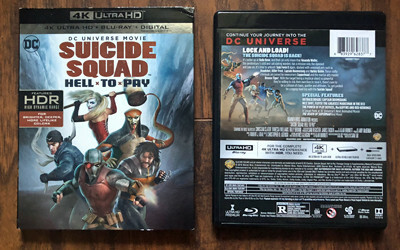 Unfortunately, none of the extras for Suicide Squad: Hell to Pay -- not even the Audio Commentary with James Tucker and Alan Burnett -- can be found on the 4K disc itself, instead all dropped onto the separate Blu-ray disc. Honestly, folks aren't missing much not having the track on the 4K disc: the commentary's observations are light, occasionally insightful, but mostly superficial and endlessly focused on the unvirtuous aspects of all the characters. Little interesting tidbits crop up here and there -- the appearance of certain jesterly characters and how they predate Harley Quinn by several years, a meaningful subplot involving Waller, why exactly they wanted the film to have aspects of being a "road picture" -- but there's a bit of plot description and obvious observations throughout that drag the pace down. Luckily, Batman: Assault on Arkham had two central aspects that were focused upon for its extras -- the asylum itself and Harley Quinn -- which allows this disc to explore some of the other elements of the Suicide Squad. Outback Rogue: Captain Boomerang (5:14, 16x9 HD) focuses on the rationale behind Harkness' inclusion into the team, elaborating upon his tools, his evolution from a lighthearted villain to a darker and more intense rogue, and how he's a bigger liability and untrustworthy member for the squad. Nice Shot, Floyd! (5:36, 16x9 HD) centers on Deadshot in a similar fashion to the Boomerang piece, exploring the complexity of his character and how that relates to his family, his evolution from his first appearance in the Bat-verse to a more technical guy, and precisely why Waller relies on him as a leader for the group. Both include interviews with the creative team behind the DCAU and Hell to Pay, and it amounts to a nice ten-minute exploration of the two characters. There's a third, awkwardly elongated extra crafted for Hell to Pay: The Power of Plot Devices, MacGuffins and Red Herrings (10:30, 16x9 HD). In this, the interviews stumble around drawing distinctions between those components of screenwriting, even including clips that feature Hitchcock and a pair of Humphrey Bogart films that are "guilty" of using these elements. Thing is, they get a little loose with labeling certain screenwriting devices, especially when the subject shifts to MacGuffins. It's an amusing way of discussing the aspects of writing about motivations, but folks watching might want to bone up a bit on the traditional definition of a MacGuffin before watching. WB and DC have also included three different Sneak Peeks: one for The Death of Superman (7:06, 16x9 HD), one for Assault on Arkham (7:29, 16x9 HD), and one for Superman/Batman: Public Enemies (7:48, 16c9 HD). They've also tossed in a few animated episodes From the DC Comics Vault. 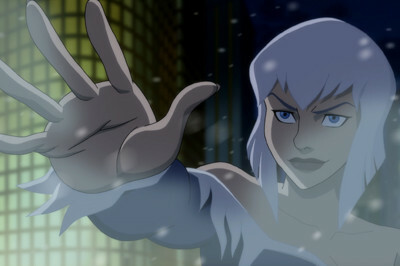 The DCAU has made several attempts to highlight the antiheroic and more mystical elements of their universe with the last couple of animated features, from Justice League Dark to Batman and Harley Quinn, in hopes of reaching the right blend of roguish characterization and outlandish comic action. Suicide Squad: Hell to Pay gets even closer to the right mixture, telegraphing an equally entertaining and unashamedly R-rated follow-up to "Assault on Arkham", one that again gathers some of the B-characters from DC's gallery and hurls them into a dangerous mission that'll knock off some prison time if they're successful. I'm not entirely convinced by Christian Slater as Deadshot, there's some patchy superhero logic in spots, and the pursuit for a "Get Out of Hell Free" card is, on its own, eyeroll-worthy in its simplicity and flippantness. Everything still gels together into a fiercely entertaining cat-and-mouse sort of action movie, though, driven by darkly humorous dialogue, smartly assertive violence, and usage of said "Get Out of Hell Free" card to highlight the malleable morality of the squad members. WB's 4K disc looks terrific and sounds great for a legacy track, and contains a nice arrangement of extras. Recommended.